It’s no more in the league of also-rans, overshadowed by stylish apparel, trendy handbags and chic jewellery. With consumers treating eyewear on par with other accessories, designer brands have upped the ante, combining cutting-edge technology with iconic designs that leave us spoilt for choice. This summer, dapper eyewear is pushing the mercury further north, donning pastels, prints and buckles as luxury brands try on snappy designs. The last decade has seen the sartorial landscape come alive with unexpected designs for an accessory that was once relegated to a mere functionality. While celebrities—such as John Lennon, who popularised retro round frames, and Tom Cruise, who created a cult with his aviators in Top Gun—made sunglasses ‘cool’, eyeglasses weren’t far behind, getting a trendy makeover as more and more athletes and red carpet attendees made wearing frames fashionable. In India, the trend took off about five years ago, with a surge in luxury buying and a proliferation of products from international fashion houses. Suddenly, the characteristic features of couture, whether it was Gucci’s distinctive bamboo detailing, Roberto Cavalli’s animal prints, Alexander McQueen’s skulls or Fendi’s ‘Pequin’ stripes, weren’t just on bags, clothes or shoes but boldly incorporated in eyewear too. Indian consumers now view eyewear as another high-end accessory that not only reflects the prestige of the brand, but also as something to be worn according to occasion and context. Today, an urbanite can choose to wear a plain rounded, pilot-shaped metallic frame in a shade of brown-orange by Tom Ford for work, a lightweight, durable plastic frame from Smith (a leading outdoor sports eyewear manufacturer) at the gym, silver-pink tinted sunglasses from John Jacobs while driving to lunch, an electric blue Prada with gold embellishments for high tea with the girls and a black butterfly-shaped Dolce & Gabbana with a trellis of almond flowers on the temple during a night out on town. Summer ushers in a new season of eyewear too. Mirrored lenses in colours like pale pink, sky blue and gunmetal yellow are in, as are pastel frames in icy green, lilac, and light pink. Some brands like Gucci even combine the two in sunglasses that pack quite a punch. Colour gradients and colour blocking, which puts together contrasting colours such as orange and purple, are the hottest trends. Along with graphic prints (animalier and geometric), modern dégradé effects (where colours are gradually shaded) in candy shades are also the rage. With trimmings and trappings ranging from metallic inserts and Swarovski crystals to precious and semi-precious stones, Jimmy Choo and Roberto Cavalli have found exotic ways to add bling to eyewear. And while the pilot silhouette continues to be in vogue, brands from Prada to Ferragamo are going retro. 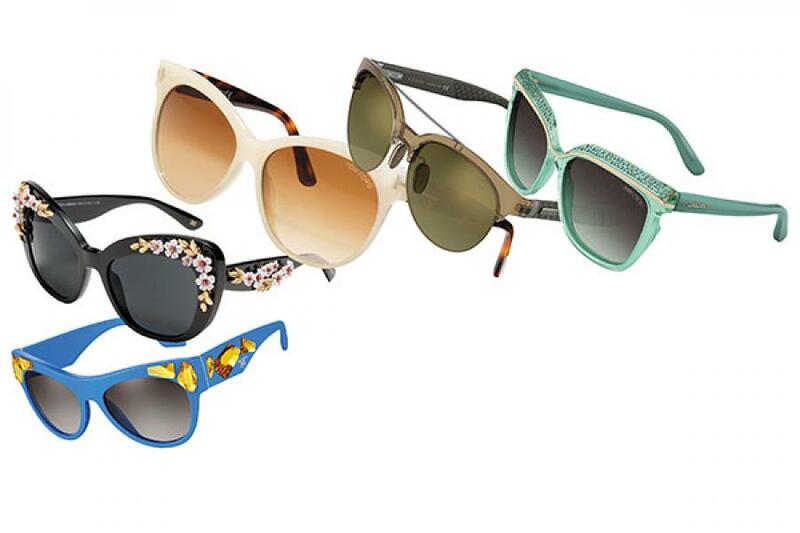 Large frames reminiscent of the ’50s, period square shapes of the ’60s, cat eye and butterfly frames that bring Grace Kelly and Lauren Bacall to mind are also some of the most trending silhouettes in 2014. This, of course, doesn’t take anything away from contemporary designs being introduced this season. Safilo Group (the second largest manufacturer of eyewear in the world, which also designs frames for brands like Boss, Fendi and Jimmy Choo) for instance, has encouraged its home brand Safilo to collaborate with the likes of Danish artist Sigrid Calon (who has infused his latest summer collection with colourful, geometric stripes and checks) as well as Australian designer Marc Newson to instil their own personality on eyewear, turning a no-frills object into a canvas for creativity. With the use of carbon fibre (by Gucci and other houses) and rubber (by the likes of Dior), especially on the temples and earpieces, high fashion demands innovation. The practice of adding metal inserts to acetate frames has become common, and we now see brands like Diesel incorporating denim, Max Mara using leather and, of course, Gucci using real bamboo in their frames. To cater to those of us who are environmentally conscious, brands like Gucci have developed frames in a bio-based acetate that contains a higher proportion of natural components as well as a new material called Liquid Wood—an eco-friendly alternative to plastic (created using natural wax and wood fibre). Similarly, Smith has invented another bio-based material called Rilsan Clear (derived from castor beans) to replace nylon. These developments are showcased at the annual Mido Optical Fair (the world’s largest optical fair held in Milan) and hold testimony that the eyewear industry is only going to get more advanced. And why shouldn’t it? After all, its capitalisation, especially in an emerging market like ours, is huge. Whether it is Ermenegildo Zegna or Chanel, luxury brands have had great success in penetrating the domestic market by offering low-cost alternatives. Paolo Ciarlariello, president, wholesale, Asia Pacific, Middle East & Africa, at Luxottica (the world’s largest producer of eyewear, headquartered in Italy), which not only has its own brands like Ray-Ban and Oakley, but also produces for brands like Dolce & Gabbana, Prada and Giorgio Armani, agrees. “India is one of the drivers of Luxottica’s growth in the emerging markets, where net sales kept growing in double digits in 2013; we believe this trend might continue in 2014.” We no longer need to go across the pond to get the latest in eyewear—India is finally in the eye of fashion.